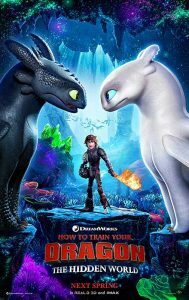 The How to Train Your Dragon animated movies have been hits with both audiences and critics over the last decade. Based on the books by Cressida Cowell, the movies tell the story of Hiccup (such a great name! ), an awkward Viking boy, who befriends a young dragon named Toothless. In the first film, Hiccup is taught by his father that dragons are the enemies of humans. However, Hiccup takes a risk to find out that he can befriend the enemy. Dragons and Vikings become friends. In the third installment, The Hidden World, Toothless falls in love with an elusive dragon. Hiccup finds that not everyone wants to make friends with dragons, so he sets out to find a place where dragons can live protected from humans. That’s about all there is to Part III. Hidden World falls short of the first two segments in its storyline. Even the great effects with soaring dragons fall a little flat here. What Hidden World does have going for it are its great characters. Hiccup continues to be a reluctant hero, doubting himself. Voiced perfectly by actor Jay Baruchel, it’s impossible to imagine anyone else as Hiccup. Toothless is loyal and a little mischievous. As in life, both boy and dragon are wounded by the battles of life, but survive and move on. Hiccup’s girlfriend, Astrid, is spunky, tough and encouraging. There are plenty of other Viking friends around for comic relief. All three Dragon movies are hip and funny, without resorting to crude humor, like other animated children’s movies. It’s the relationship between Hiccup and Toothless that has always been the heart of the movies. And that relationship doesn’t disappoint here. As Toothless falls for his dragon mate, it becomes inevitable that he and Hiccup must go their separate ways. The farewell scene between the two old friends is touching indeed. Hiccup learns that if you love another, you have to give them freedom. And so he lets Toothless go. I admire the filmmakers for letting the series come to a definite end, and not continue with endless sequels as many franchises do. No doubt the How to Train Your Dragon movies will be fondly remembered and watched by kids and their parents for years to come.